and it is set by calling the GLFW function glfwSetKeyCallback. If everything is done correctly, you should be able to quit the game by pressing Esc. In the inner if statements, we first check for the cases where the player is close to the boundary. In this case we limit the movement of the player sprite so that it remains inside the game boundary. There are different ways to implement firing of projectiles. I think originally, only one projectile could be present in the game. Here I chose to fire a projectile every time the player releases the button. We then add a new struct for the projectiles, like we did for the Player, Aliens, etc. and add a flag in the Alien struct indicating the alien type. 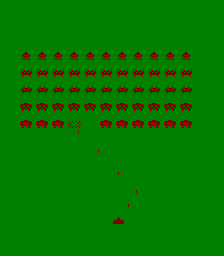 We then store the alien sprites as an array indexed by the alien type and animation frame index. at each frame, if an alien is dead, we decrement the death counter, and "remove" the alien from the game when the counter reaches 0. When drawing the aliens, we now need to check if the death counter is bigger than 0, otherwise we don't have to draw the alien. This way, the death sprite is shown for 10 frames. If the bullet sprite overlaps with the alien sprite, we remove the bullet from the game, and change the alien type to ALIEN_DEAD. Note that we use a haphazard way of re-centering the death sprite as we are not properly handling sprite centering in our game. If you compile this post's code, you should be able to blast some aliens! In this post, setup the most important part of what makes a game, a game; interactivity. Using GLFW, we bound keys for moving the player and firing projectiles. Even though though the game is still at a very incomplete state, we can already have some fun firing bullets at the aliens. Enjoying the process is very important in game development and is what sparks experimentation of new ideas. You see that we are able to setup a game prototype in a low level programming language with very little effort. More importantly, we can reuse this code to create prototypes for other 2D games. In the next post we will create the necessary tools to draw basic text on screen, and we will keep track and draw the player's score.